There is nothing like a hot lunch during winter, and a thermos or insulated food jar makes it easy for you to take your own zero waste hot lunch, saving you money and waste on expensive takeaway. But with so many insulated food jars available, how do you know what’s right for you? A thermos or insulated food jar is a container or bottle with a double-walled container inside of it. The air between the two walls is removed when the product is manufactured, creating a vacuum. This allows it to keep food hot by not allowing heat to escape. A thermos keeps food cold in the same way. Heat from the outside that might otherwise transfer to the cold contents of the insulated food jar, is prevented from reaching it because of the vacuum between the thermos wall. What foods can go in an insulated food jar? Our insulated food jars are ideal for both hot and cold food. We have large and small thermos depending on the quantity of food to be added. Foods like soup, stew, curry, pasta and stir-fry will keep warm for hours in an insulated food jar. Some customers even like to pack toasted sandwiches or last night’s pizza! Meanwhile, yoghurt, muesli and fruit salad are great cool food options. Our Goodbyn 2-in-1 insulated food jars (pictured above) have a 470ml stainless steel container, plus a 235ml glass screw in compartment. 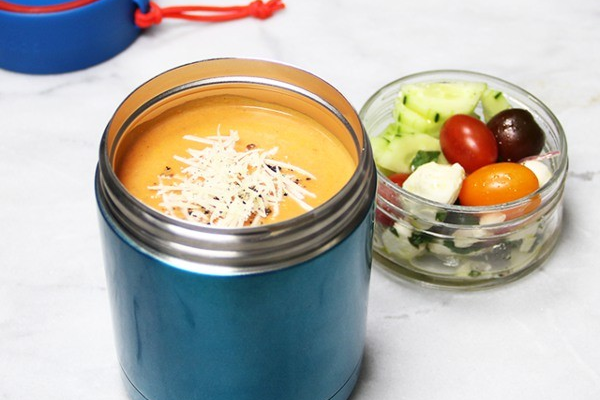 You could pack soup in the stainless steel compartment and croutons or salad in the glass compartment. These jars are uniquely designed to avoid landfill and be almost fully recycled at the end of its life, unlike most insulated food jars. With all of our insulated food jars, if you pack your lunch at 7am, you can expect it to still be nice and warm, or really chilled if you packed a cold lunch, by 12 noon that day. What insulated food jars are best for kids? This really depends on how much your child eats and how easily they find opening the insulated food jar lid. We recommend doing a few test runs at home before sending you kids to school with one, just to make sure they are comfortable using it. Our insulated food jars range in size from 290ml capacity to 750ml. Some are short and wide in design, while others are tall and skinny. We also have some larger insulated food jars that are more suited to adults or older teens, including the Goodbyn insulated food jars, BBBYO foodie and Thermos King. You may notice that the LunchBots insulated stainless steel containers that we sell have all stainless steel on the inside of the lid, while our other other insulated food jar lids are all plastic. The colour and smell of the food isn’t absorbed by the plastic on the inside of the lid, making it easier to keep clean. How do I get the maximum heat retention from my insulated food jar? In the table below we have listed the maximum amount of time you can expect your food to stay warm or cool for. To keep your food warm or cool for as long as possible, we recommend pre-heating or pre-cooling, as follows. Preheat your insulated food jar by filling it with boiling water. Leave for five minutes before pouring out and adding your hot food. Keep in mind that the the more air or free space you leave in your insulated food jar, the quicker the contents will cool down, so it’s best to use a jar based on how much food you will be filling it with.